At 8.00pm last night islanders gathered in the plenary hall of the CiF for a special session of Formentera's council of entities (Consell d'Entitats). Mobility councillor Rafael González went over the proposed bid to manage how motorists bring vehicles to the island, and how they circulate and park whilst here. The effort is an offshoot of legislation, passed on January 29 in a full assembly of the Balearic parliament, for Formentera's environmental and economic sustainability. 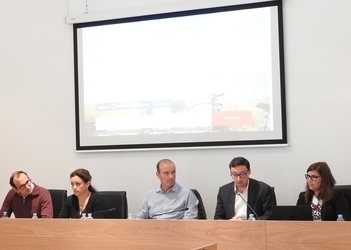 The CiF president, Jaume Ferrer, gave an overview of the twists and turns from September 2014, when the Consell d'Entitats called for authorities to begin regulating vehicle ingress on the island, to yestereday, when the proposal came before the coalition. 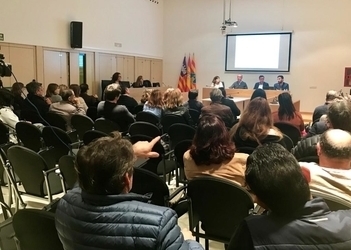 Participants, who requested a week to relay details of the proposal to their associates, will gather again next week to address questions on the issue and listen to Consell representatives' take. Drivers on the island will have all of July and August to register for the first year of the programme. Only those individuals from outside the Balearics will be required to pay the associated fee—one euro a day for cars and fifty cents/day for scooters. The mobility councillor described it a “symbolic fee” designed to “help authorities assess the system in its first year”. Visitors arriving from outside the archipelago will benefit from a fifty per cent discount if the vehicle they use is hybrid, while those with electric cars will pay nothing at all. Formentera residents are also dispensed of the fee, as are individuals with a second residence on the island; Eivissa residents employed on Formentera; motorists with authorised rental cars; residents of Eivissa, Menorca and Mallorca; and individuals driving historic vehicles affiliated with classic vehicle clubs. Exemption from the vehicle-entry fee also extends to individuals with reduced mobility, official vehicles, public service vehicles, freight vehicles and industrial machinery. An online platform, activated during the first half of April and accessible via computer, tablet and mobile phone, will enable those wishing to visit the island with their vehicle to check availability in advance. If space exists, drivers will pay a fee to obtain authorisation. Residents of the Balearics will complete a similar process, though no fee will be assessed. Given the Council will use data obtained during the blue and green zone accreditation process, Formentera residents with a parking permit are dispensed of the new formality and will be able to enter and exit the island —plus circulate and park— without impediment. Individuals who do not possess a permit to park will have to complete the formality, while bypassing the associated charge. Rental car companies must certify their vehicle fleets, either at the Citizen's Information Office (OAC) or online through the Virtual Citizen's Information Office (OVAC). This step must be completed before accessing the platform to receive accreditation, which will be based on number plates of the vehicles in question. Legislation also provides for “dissuasive penalties” of €1,001 to €10,001. 1. Tracking vehicle entry based on number plate readings in the la Savina port. Software will be deployed to check if vehicles have received the required authorisation. Any unauthorised vehicle entry will trigger an alert. 2. Parking checks (performed by blue zone metre attendants) based on number plate readings. 3. Checks of private rental cars via online platforms. 4. Police checks on local roads. Formentera-based firms will be limited to 2,700 authorisations for cars and 7,000 for scooters. There is no quota for quads, camping cars or motor homes. To obtain authorisation, businesses must register via the “DRIAT” system (Document Responsable d'Inici d'Activitat Turística). Permits will be awarded in the order that applications are received and until quotas have been reached. Limits of 2,280 cars and 230 scooters will be in effect for Formentera's visiting motorists. No quota will be applied for quads, camping cars or motor homes. Authorisations will be awarded in the order that applications are received and until quotas have been reached. Maximum entry quotas —220 cars and 20 scooters— will also be imposed on Eivissa residents travelling to Formentera with their vehicles. There is no quota for quads, camping cars or motor homes. Authorisations will be given out in the order that applications are received and until quotas have been reached. Legislation calls for transitional measures to be implemented during the programme's first year. Non-resident visiting motorists and visiting motorists from Eivissa who, prior to the approval of publication in the BOIB of the present arrangement, were already in possession of one of three things —a reservation, accommodation on the island and/or a Formentera-bound boat— will be allowed to access, circulate and park on island roads whether or not quotas have been reached at the time of applying for authorisation. All other vehicles —of Formentera residents, for example, and emergency services— are exempt from entry limits. An exception exists for persons with a second residence on Formentera; such individuals are by law limited to authorisation for one vehicle. If the proposal is ratified by the Consell d'Entitats and receives the green light at the administration's March plenary assembly, the Formentera Council will pilot an expanded nationwide campaign to raise awareness about the pioneer programme. Councillor González also spoke about a series of simultaneous upgrades to public transport. This summer, the L1 and L2 bus lines linking Formentera's largest towns —where most of the island's population is concentrated— will be coordinated to offer transportation service every thirty minutes between la Savina, Sant Francesc and Sant Ferran. Schedules will be coordinated with ferry arrivals and departures. The six remaining bus routes will remain unchanged, providing, in González's words, “an alternative for visitors and residents who choose public transport”. The Formentera Council's mobility department announces the opening of a new parking area in the school zone in Sant Ferran. The 1,200-square-metre lot has room for roughly 40 vehicles and is located at the intersection of carrer Tarragona and the main highway. Mobility chief Rafael González described it as “a supply of available parking on the east side of avinguda Joan Castelló i Guasch while work on the remodel is under way” and “a way to facilitate parking when classes in Sant Ferran begin and let out”. González called attention to the large stock of parking spaces at the other end of the avenue alongside the ring road. 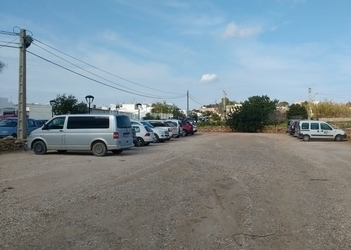 The Formentera Council is renting the land where the new car park sits for €500/month (VAT included). The Formentera Council's mobility department is rolling out a campaign to educate islanders about the"regulated" or metred parking service that has been activated in the largest towns across Formentera in recent years. Department head Rafael González said the information push sought to “clear up the questions concerning use of blue and green zone parking spaces, not just for islanders, but for visiting tourists as well”. 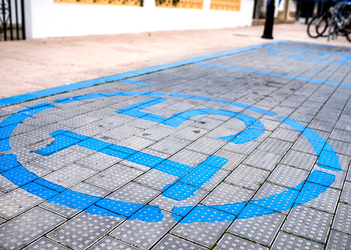 One of the campaign's chief messages has to do with the 15-minute spots incorporated into blue zone areas when Sant Francesc and Sant Ferran were prepped for the metred parking system. Anyone —both residents and visitors— can park free for up to 15 minutes; they just need to obtain a ticket. The 15-minute parking areas have been placed strategically around the two towns and were created in response to requests by local business owners keen to encourage frequent rotation of vehicles. González said the move was about “giving drivers 15 minutes to do their shopping and making it easier to patronise local commerce”. Informational material has been printed to get motorists up to speed about the ins and outs —and timetables— of the metred parking system and tackle the major questions. Metre maids will be charged with handing out the two thousand tracts among drivers who park in blue-zone spots, shop personnel and individuals driving rented vehicles. An informative poster has also been put together to spotlight the campaign's central “15 minutes for business” message and will be affixed to bus stops and other eye-catching areas. The zonablava.com website has also been created as a one-stop shop for information. A video is also expected before summer to reach out to tourists. The mobility chief thanked islanders for doing their best to use the blue zone correctly and framed such efforts as key to the parking improvements seen on Formentera in recent years. 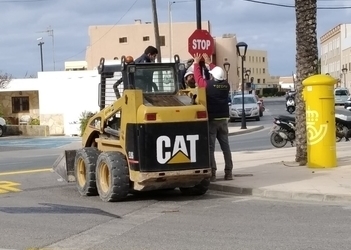 The Formentera Council's mobility office reports that la Savina's carrer del Carme reopened to two-way vehicle traffic this morning, enabling entry and exit to the east end of the town's port and leaving Passeig de la Marina as an exclusively pedestrian area. Carrer del Carme was a two-way road until it was equipped with “blue zone” parking spaces in 2015 and became one-way only. In addition to necessary traffic signage, new road surface markings were painted in yellow to signal the change; crews will repaint them white when work on the adjacent passeig, or promenade, is complete. Balearic Port Authority is overseeing the second phase of the la Savina port's full remodel, which includes transforming removing car traffic from that part of the port and making Passeig de la Marina a pedestrian-only space from carrer del Vapor Manolito to carrer del Carme.